This little box of fun was sitting on my doorstep earlier. It contains a variety of items to help you improve your yoga. 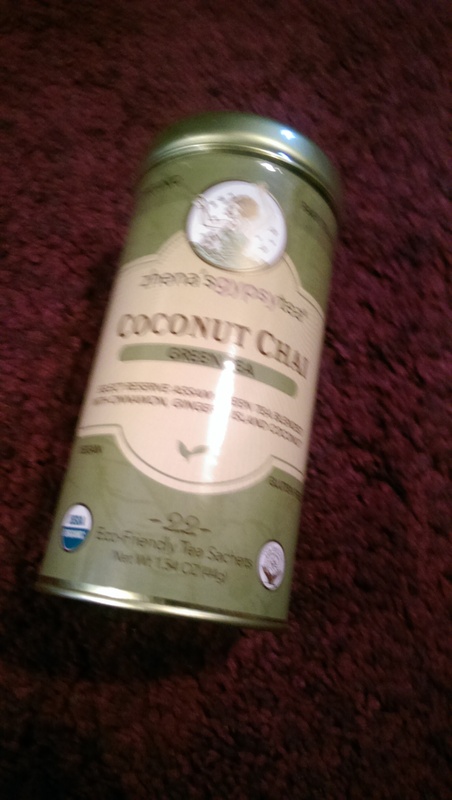 Containing cardomom, ginger, clove and coconut, this tea is Gluten-Free, fair trade and hails from India. I had a quick sniff and it smells delish. Aura Cacia Peppermint & Sweet Orange Yoga Mist – multi use essential oil spray. Can be used on your mat, in the room and on your body. It’s quite a heady mix, but as it’s paraben and petroleum free, organic and cruelty free, I might just spritz this everywhere. 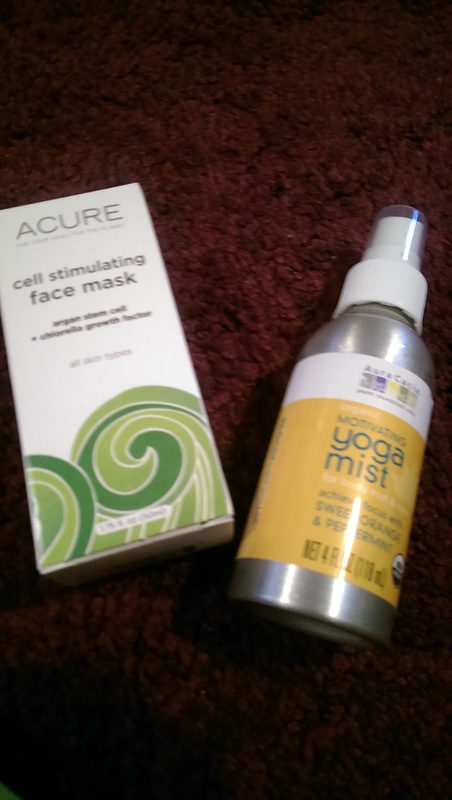 Acure Cell Stimulating Facial Mask – I have a lot of face masks floating around, some, like this, are clay based and those aren’t my favourite. But if you’re a clay mask fan this chemical free (I can pronounce all the ingredients) one might be right up your street. 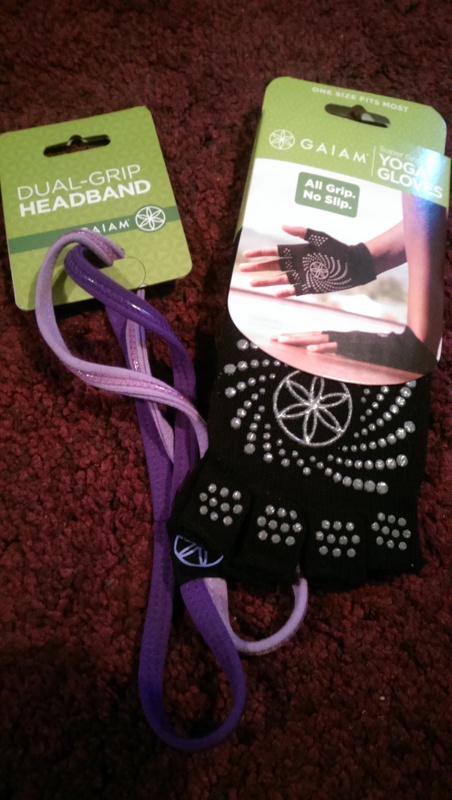 Gaiam dual grip headband (and yoga gloves) – cotton headband designed to keep your hair (and sweat) out of your face while you get your downward dog on. 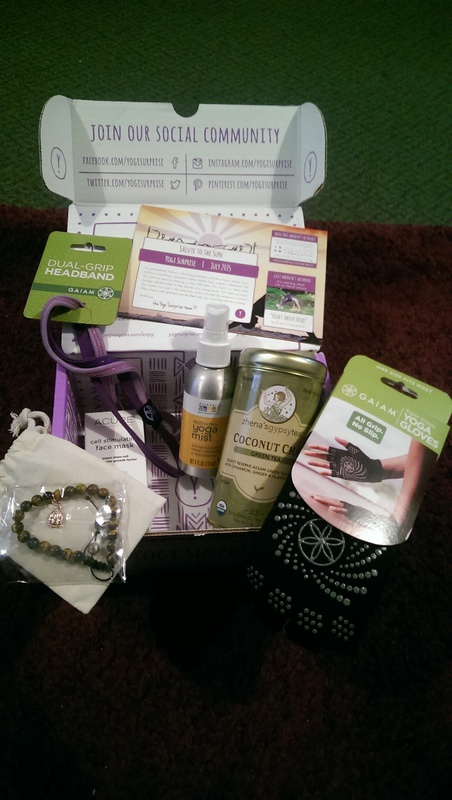 I also got another pair of the yoga gloves that were in June’s box – must have forgotten I already had some! 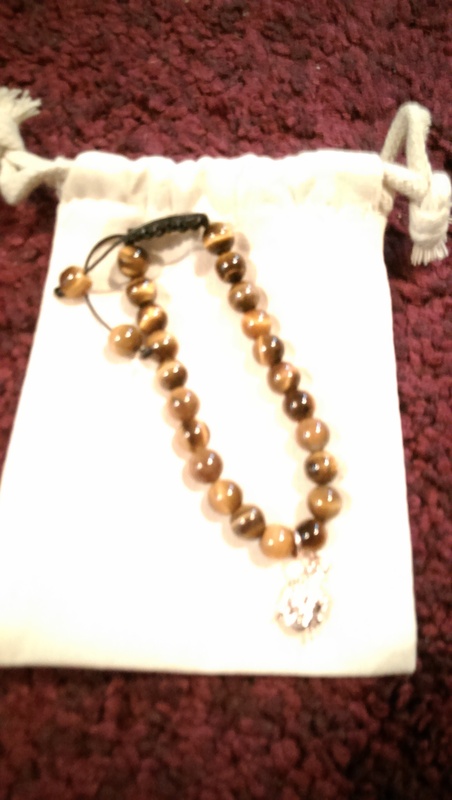 Finally was a jewellery item – a tiger’s eye bracelet with Buddha charm. The Buddha has been co-opted into the modern yoga world in a way that feels a little like appropriation – although meditation is a Buddhist practice, the Buddha’s religious significance is often forgotten in the rush to put his face and image on things from cushions to garden ornaments. If I wear this bracelet I will have to do so mindfully – I’m not a Buddhist and must be aware of the fact that some might not like my apparent use of their religious leader’s image for decoration. That aside tiger’s eye blends Earth and Sun together and is supposed to give you clarity.